China's Communist Party is set to host a high-level meeting in Beijing that will usher in a much-anticipated reshuffle of the ruling party's top leadership. Strict security measures have been put in place, along with sweeping online censorship controls to ensure its success. While China's general public may view the tightening controls as a short-term extra-vigilant approach by top leadership ahead of this week's meetings, observers warn they are not passing trends. Instead, they say they are part of a long term vision of control. FILE - Chinese President Xi Jinping toasts during a reception at the Great Hall of the People on the eve of the Oct. 1 National Day holiday in Beijing. “This is not about riding out a storm – it’s about changing the weather,” said David Bandurski, co-director of the China Media Project, an independent research program in partnership with the Journalism & Media Studies Centre at the University of Hong Kong, in a written reply to VOA. He said that, since late 2012, Chinese President Xi Jinping has managed to exercise a level of control over the media landscape that is unprecedented in the country’s reform era. Xi’s vision of control is evident in the recent crackdown on virtual private networks (VPNs) and the raft of new regulations accompanying China’s Cyberspace Law, which Bandurski said redefines propaganda around the individual Internet user. More recently, Xi has taken even more aggressive steps, such as pushing for the government to buy shares in local tech companies, he added. Tuo Zhen, center back, spokesperson for the 19th National Congress of the Communist Party of China speaks during a press conference at the Great Hall of the People in Beijing, China, Oct. 17, 2017. 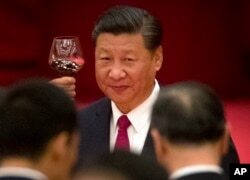 Unlike his predecessors, Xi understands the power of the Internet and has ensured that all regulations to control China’s Internet are fully enforced, said a founder of GreatFire, an organization dedicated to fighting the so-called Great Firewall of China, who goes by the pseudonym Charlie Smith. Smith says that the Chinese government’s initiatives to make it harder to evade censorship will be the “new normal” with a worrying effect. “Sadly, we are seeing that foreign companies are willing to work closely with the Chinese authorities to limit Internet freedom in China,” the activist said in an email to VOA, referring to Apple’s decision to remove VPN apps from its app store. The situation will quickly worsen if other companies follow suit, he warned. 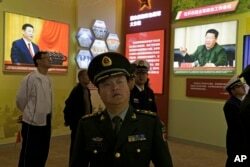 A Chinese military officer walks past photos of Chinese President Xi Jinping at an exhibition highlighting China's achievements under five years of Xi's leadership at the Beijing Exhibition Hall in Beijing, China, Oct. 17, 2017. He added that, in the run-up to the 19th party congress, it’s not surprising for authorities to monitor sensitive keywords on Chinese social media. Even the keyword “19th Party Congress” was tightly controlled because the authorities want the good messages to get out on social media and the bad messages to be deleted, he noted. The movie Youth by Feng Xiaogang, which tells a love story during the Sino-Vietnam war in the 80s, was also said to be pulled off the National Day schedule due to its political sensitivity. According to local media reports, online discussion about the movie was also banned. Making things worse, Chinese authorities have further detained 14 activists on charges of “picking quarrels and provoking trouble,” ahead of the meetings, according to China Human Rights Defenders. 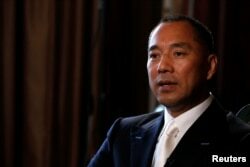 Billionaire businessman Guo Wengui speaks during an interview in New York City, April 30, 2017. Those include dissenters and netizens who have discussed corruption allegations made by fugitive Chinese tycoon Guo Wengui as well as a professor who had called for democratic elections at the upcoming party congress, the rights group said. “This kind of top-down directives about making sure that there’s nothing that can embarrass the leader in this period, and the way this is being enacted has been fairly aggressive,” said the group’s researcher Frances Eve. Eve however noted it remains to be seen if any public backlash toward the government’s tightening controls would emerge. “[The] slow grind of ever-increasing controls and repression makes it harder for people to sort of realize it is like kind of an analogy of a frog being boiled alive in a pot,” she said. Over the past few weeks, a state media blitz has highlighted the party's achievements over the past five years, but few people that VOA spoke with were even paying attention to or had much to say about the political gathering. “We don’t know much about politics. I’m not interested in those things, unless it relates to my company or work. The only thing that bothers me now is that express delivery services have been suspended. So, I have to go shopping myself,” said a lady surnamed Li. “[People] care less about whether he [Xi] has consolidated his own power, but more about whether he has strived to improve people’s livelihood, which is the top priority. I won’t say much about him as long as China is on the right track,” a party member surnamed Wu added.